Based in Maine, Kristie Dailey began her writing career in 2010. Specializing in the health field, her articles appear on eHow and LIVESTRONG.COM. Dailey has taught at a nursing school, and she has a Master of Science in Nursing from the University of Southern Maine. Normal growth and development of infants have a known course, known as developmental milestones. The age and order in which they occur are markers of the normal maturation of neuromuscular development. A newborn requires head support, and its head will lag behind its shoulders when lifted. By 3 months, the baby should be able to keep its head in line with its torso, without head lag. According to PediNeurological Exam, by Paul D. Larsen, M.D. from the University of Nebraska School of Medicine, and Suzanne S. Stensaas, Ph.D. from the University of Utah School of Medicine, head lag is when you pull a baby from a supine to a sitting position, and his head lags behind the trunk. As the baby grows stronger, it can control its neck muscles more easily and the head lag should disappear. Measurement of head lag happens at each well-child check. According to Ludwig von Hahn from Tufts University, a doctor measures head lag by first placing the infant on its back in a supine position. Then, while keeping the baby's arms flexed, pull it to a sitting position. The amount of head lag is how far the head lags behind the shoulders when pulled into the sitting position. Infants should accomplish certain tasks at certain times. The specific age at which the child acquires each of the motor milestones is variable and less meaningful than the pattern of motor development. Babies develop from head to toe and in a proximal to distal pattern. 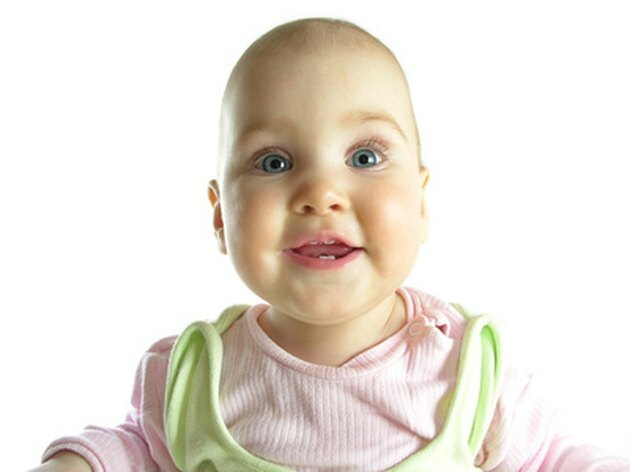 According to About Kids Health, by 4 months of age, babies should show no signs of head lag. Head control is the first movement a baby achieves, and is necessary to attain other movement skills such as sitting, crawling, and walking. Your baby will develop head control in three major positions: prone (on her tummy), supine (on her back), and in a sitting position. According to National Network for Child Care, you should place your baby on her stomach to allow her to develop neck strength. As the baby's neck becomes stronger, head lag lessens. Other activities that promote neck strength are shaking a rattle on either side of your baby's head to encourage her to turn her head, use a flashlight for the baby to follow from side to side, and gently stroke the side of your baby's cheek with your fingers to encourage her to turn her head. Identifying an infant with a developmental delay is important. According to Gillette Children's Specialty Healthcare, early intervention for an infant with developmental delays makes a big difference in functional and psychological outcomes. Early detection puts services such as physical therapy and occupational therapy into place. The sooner you do this to address the developmental delay, the better the functional outcomes. What Muscles Are Worked During Neck Extensions?